Louis Godin was born on 12 November 1923 in Lac-Drolet, 125 kilometres south of Quebec City. He was placed in an orphanage in Lévis when he was 11. At 16 he left and began work in western Quebec. Louis kept going west and worked the harvest near Winnipeg for three months. When the season finished, he joined the Canadian Army at a recruiting centre on Portage Avenue in Winnipeg. Louis was 18 when he joined the Royal Canadian Armoured Corps in 1942. He trained at Valleyfield, Borden, and Valcartier before shipping overseas as an infantry replacement in August 1943. In the United Kingdom, he joined Les Fusiliers Mont-Royal, helping them rebuild following the disastrous Dieppe Raid the previous summer. Private Godin landed at Courseulles-sur-Mer, France on 7 July 1944 as a member of “B” Company. His unit arrived just in time to take part in the offensive to capture the southern suburbs of Caen and the ridge beyond. While the suburbs fell, the ridge was another matter. 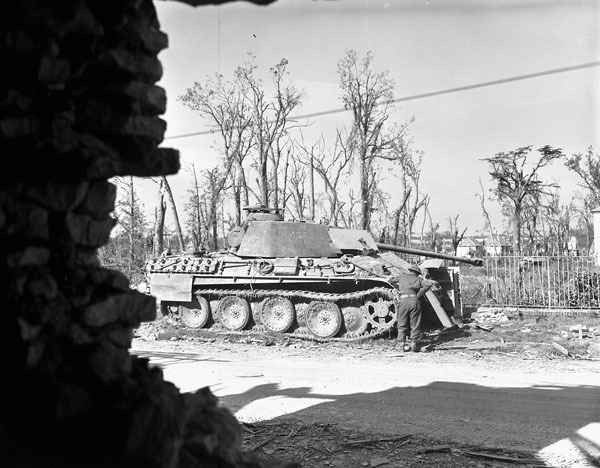 On 21 July 1944, after assaulting and capturing Beauvoir Farm on the northern slope of Verrières Ridge, “B” Company was overwhelmed by a German Panther tank counterattack. Godin’s unit surrendered when it became isolated from the rest of the battalion and ran low on supplies and ammunition. Now a prisoner of war, the Germans sent Louis through France and Germany to a camp near Teschen (Cieszyn), on the present-day Czech-Polish border. Here he was forced to work in a coal mine before the Russian advance prompted the Germans to move their prisoners into Germany. Louis survived the march despite the lack of food, freezing temperatures, and the cruelty his guards showed prisoners. In spring 1945 the Americans arrived, and Louis was freed. He returned to England in the bomb bay of a Lancaster bomber. Louis served once again during the Korean War. He married Suzanne Marcoux, and they had three children. Louis passed away at Paul Triquet House, a retirement facility for veterans in Quebec City, on 25 March 2017. He was 93 years of age. Louis Godin was a prisoner of war for nearly 10 months. Some 9,000 Canadians became prisoners of war during the Second World War. Some, like Louis, were captured in larger groups. Others were captured in ones and twos, especially members of the Royal Canadian Air Force who bailed out of their aircraft over enemy territory. Generally, the Germans treated Canadian prisoners of war (POWs) humanely. The Normandy massacres, involving the deaths of 156 Canadian POWs were major exceptions. Being a POW in Nazi Germany in 1944 and 1945 was also dangerous. The Allies had air superiority, and their aircraft were constantly on the lookout to destroy trucks on the road or trains travelling behind the front. Godin recalls being given a small white flag to wave from the back of the truck he was put in to leave Normandy. As the war progressed the situation deteriorated in Germany and its occupied territories. Food became increasingly scarce. Godin remembers that his daily menu consisted of a soup broth, a rotten potato, and a piece of black bread. Once per week they also got a piece of sausage and a slice of cheese. As the Russians closed in from the east in the winter of 1945, prison guards attempted to move their charges back into Germany. These death marches saw the prisoners, often with very little winter clothing, walking hundreds of kilometres in icy conditions. Louis Godin was captured during his first battle. 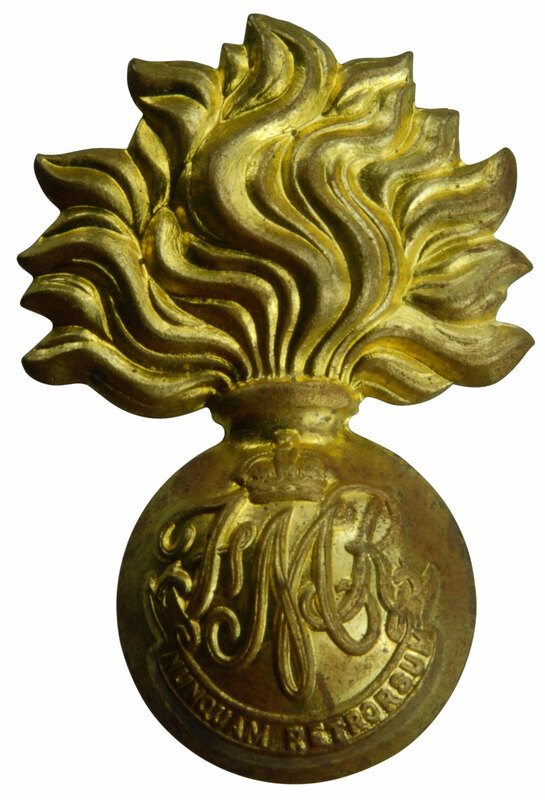 His unit, Les Fusiliers Mont-Royal, was part of 2nd Canadian Infantry Division. They arrived at Juno Beach in early July 1944, over a month after the D-Day assault. 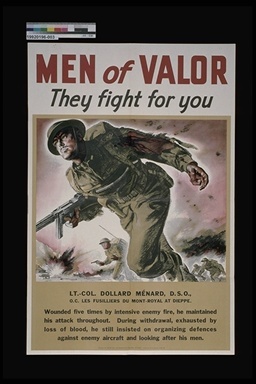 By then, the Battle of Normandy had developed into an attritional struggle, with Allied forces fighting to wear down determined German defenders. 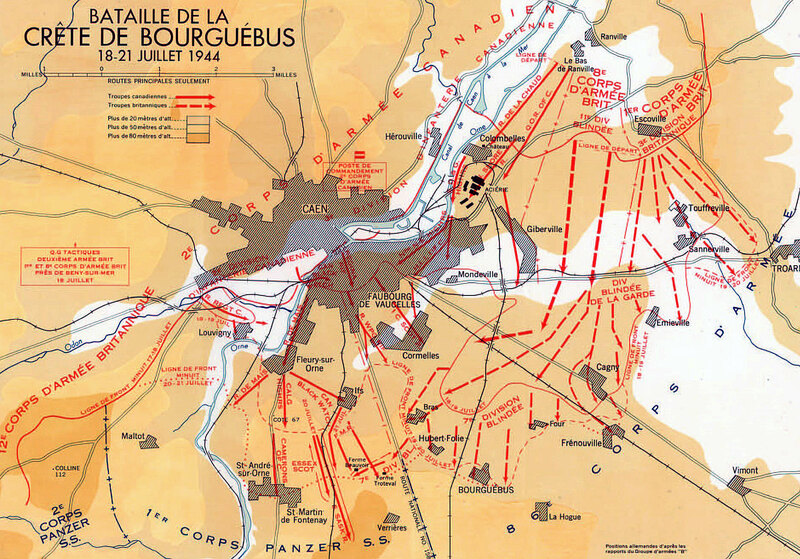 Caen, a major Norman city, fell on 9 July to a combined British and Canadian assault. The suburbs and industrial zone south and east of the medieval city remained in German hands. The British devised Operation Goodwood, a massive tank assault sweeping east and south of Caen, as one of a series of attritional blows that would stagger the German defenders in Normandy. 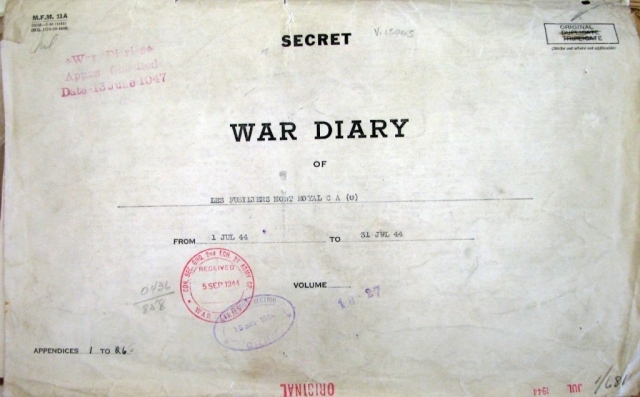 The Canadian role in Goodwood was Operation Atlantic (18-21 July 1944). Third Canadian Infantry Division took Caen’s southern suburbs and eastern industrial zone by 19 July. 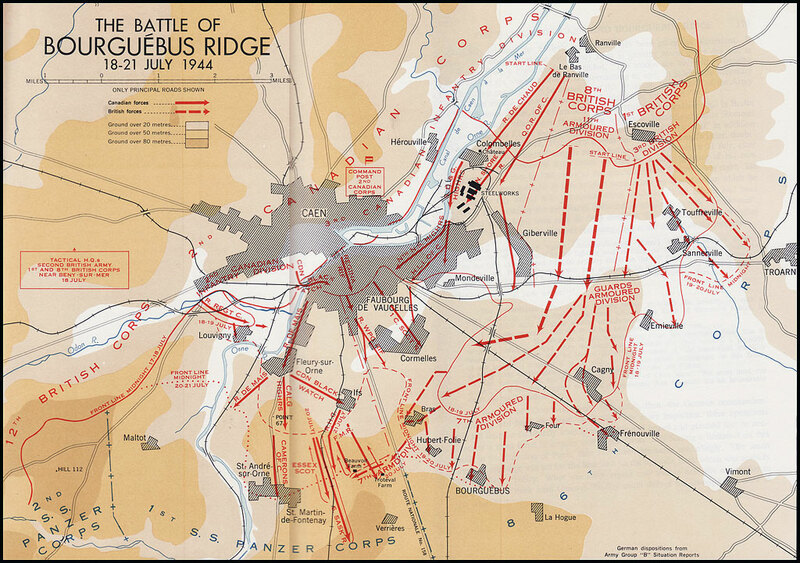 The next day, 2nd Canadian Infantry Division attacked Verrières Ridge. Louis’s battalion reached its objective, but a combination of torrential rain (which limited air and artillery support) and a major German counterattack pushed them back. Private Godin’s “B” Company and “C” Company nearby attempted to hold their ground, became cut off, and surrendered. This was a devastating blow to Les Fusiliers Mont-Royal. The casualties described above and further casualties in the fight for the ridge meant that by 24 July the battalion was using cooks and drivers to hold part of their position. Operation Atlantic started well but ended short of capturing Verrières Ridge. Second Canadian Infantry Division suffered 1,149 killed, wounded, and missing during the battle. More than half of these casualties occurred in battalions like Private Godin’s on the ridge. The good news was that German commanders had to use their armoured reserves to hold back the British and Canadians. After over a month of fighting these limited resources could not hold out forever. 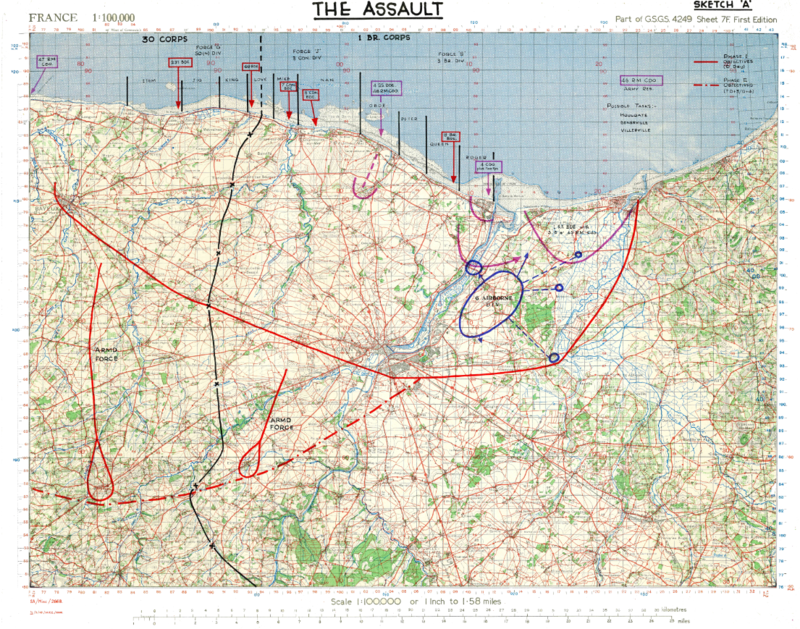 Troops push from Caen; artillery fire; aircraft assault; allied warships fire at the coast; a plane is downed in flames; mortar fire; infantry marches across the river Orne; the Falaise Highway; tanks roll in; armoured and infantry clean out the town; man with a wireless set; an injured man is carried off by stretcher; German prisoners of war. Frederick Albert Tilston of the Essex Scottish Regiment, recipient of the Victoria Cross; he is interviewed by the CBC; a nurse lights his cigarette; Tilston, in a wheelchair, is brought outside where other patients visit with him. Tilston won the Victoria Cross for bravery in action on March 1, 1945.